Peterborough is a town in Hillsborough County, New Hampshire, United States. The population was 6,284 at the 2010 census. 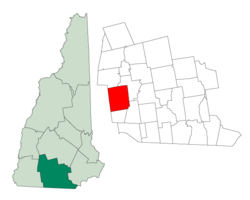 The central settlement in town, with 3,103 people at the 2010 census, is defined as the Peterborough census-designated place (CDP) and is located along the Contoocook River at the junction of U.S. Route 202 and New Hampshire Route 101. The community is 38 miles (61 km) west of Manchester and 72 miles (116 km) northwest of Boston. Abiel Abbot, after being charged with heresy by the Connecticut religious establishment, came to Peterborough as minister to the Peterborough Unitarian Church in 1827. Reverend Abbot founded the town's first prep school, the Monadnock Summer Lyceum, and the first free library in the US, all in Peterborough. Other early cultural institutions include Mariarden, a summer theatre where Paul Robeson played in Eugene O'Neill's The Emperor Jones at a time when roles for black Americans were scarce. Bette Davis performed there as a teen. Performance blossomed again in 1976, when Widdie and Jonathon Hall founded the Peterborough Folkway. "Within a few years, it became a 'must play' on the East Coast for folk musicians and continued to be a popular stop" for two decades. Regular performers included Tom Paxton, Mary Chapin Carpenter, Shawn Colvin, and Suzanne Vega. In the 1980s, thanks to publisher Wayne Green, "Peterborough was clearly the per capita magazine production capital of the world." Over 100 magazines, mostly about computers and technology, were published there; these included Byte and MacComputing. Peterborough's leadership in environmental protection began in the 1990s, when its Earth Day USA office supported the US Air Force's annual Earth Day events around the world. Peterborough is home to the first tax-supported free public library in the United States. The Peterborough Town Library was founded at a town meeting on April 9, 1833. This idea was revolutionary in a time when subscription libraries were popular. The collection of materials would essentially be owned by the people and free to access. Funds for the formation of the library were made available through the State Literacy Fund. The Reverend Abiel Abbot already had experience in creating libraries. In the six years he had spent in Peterborough prior to 1833, he had established the Juvenile Library, which he operated out of his home, and the Peterborough Library Company, a dues-paying membership library. Due to the success of Abbot's libraries, specifically the Town Library, the New Hampshire State Legislature passed a law authorizing towns to raise money to establish and maintain their own libraries. This law was enacted in 1849, making New Hampshire the first state to pass a law of this nature. The library started in the town's general store, which also served as the post office. The postmaster also served as the librarian, until Susan Gates was appointed in 1854. By 1873, it was decided that the library materials would be moved to the Town Hall, but by 1890, there were 6,000 books and not enough space to accommodate the collection and patrons. A new library was built and continues to operate as the town's library. Since construction, the library has been expanded twice, and its collection has grown from the hundred original items to over 43,000 books. A booklet on the history of the library is available at the circulation desk. According to the United States Census Bureau, the town has a total area of 38.1 square miles (98.7 km2), of which 37.7 square miles (97.7 km2) is land and 0.42 square miles (1.1 km2) is water, comprising 1.06% of the town. Peterborough is drained by Nubanusit Brook and the Contoocook River. The highest point in Peterborough is South Pack Monadnock Mountain (2,290 feet (698 m) above sea level), in Miller State Park. Peterborough is also home to Edward MacDowell Dam and Lake recreation area, where visitors can walk across the dam, hike, cross-country ski, swim, boat, picnic, play Frisbee golf, horseshoes or other recreational opportunities, many of them disabilities accessible. As of the census of 2010, there were 6,284 people, 2,713 households, and 1,629 families residing in the town. The population density was 167.0 people per square mile (64.3/km²). There were 2,956 housing units at an average density of 78.4 per square mile (30.3/km²). The racial makeup of the town was 96.1% White, 1.8% Asian, 0.7% Black or African American, 0.2% Native American, 0.02% Pacific Islander, 0.4% some other race, and 0.8% from two or more races. Hispanic or Latino of any race were 1.4% of the population. There were 2,713 households, out of which 28.1% had children under the age of 18 living with them, 45.8% were headed by married couples living together, 10.6% had a female householder with no husband present, and 40.0% were non-families. 33.6% of all households were made up of individuals, and 15.2% were someone living alone who was 65 years of age or older. The average household size was 2.24, and the average family size was 2.85. In the town, the population was spread out with 21.5% under the age of 18, 6.2% from 18 to 24, 19.9% from 25 to 44, 30.3% from 45 to 64, and 22.0% who were 65 years of age or older. The median age was 46.6 years. For every 100 females, there were 86.9 males. For every 100 females age 18 and over, there were 81.7 males. For the period 2009–2013, the estimated median annual income for a household in the town was $66,026, and the median income for a family was $89,401. Male full-time workers had a median income of $66,314 versus $34,707 for females. The per capita income for the town was $40,385. Contoocook Valley Regional High School, built in 1970, serves approximately 900 students. South Meadow School, founded in 1989, serves approximately 400 students. The school began as Peterborough Middle School. Peterborough Elementary School, locally known as PES, serves approximately 250 students. While the area has many private kindergartens, pre-schools and elementaries, The Well School, founded in 1967, is the only Pre-8 school within the town. The Well is a day school that serves approximately 160 students on an extensive rural campus. Clay Mathematics Institute, a foundation supporting cutting-edge mathematics research, is also located in Peterborough. In addition to formal education, the town has dance and karate studios, arts, sports, fitness and nature activities year round, for children and adults. Peterborough is a global village and entrepreneurial seedbed. Start-ups that grew up here include New Hampshire Ball Bearing, Microspec, Pure Flow, Peterboro Basket Company, Borrego Solar, MobileRobots Inc., Toadstool Bookstores, Froling Energy, Brookstone, and Hyndsight Vision Systems. According to a fall 2015 survey of residents, run by the Peterborough Economic Development Authority, approximately a third of Peterborough workers are home-based entrepreneurs or telecommuters. The telecommuters who were surveyed worked for corporations in many parts of the US and EU. Like the rest of New Hampshire and the Monadnock region, Peterborough's third largest industry is tourism. The town's outdoor amenities include hiking trails, wild flowers, cross-country skiing, kayaking, cycling and small lakes for swimming, sailing, fishing and ice-skating. It is a popular bird-watching area, one of two sites of the NH Audubon autumn migratory raptor count. Its cultural attractions include the Monadnock Center for History and Culture, the exhibition gallery and craft gallery of the Sharon Arts Center, the Peterborough Players theatre, Peterborough Community Theater cinema, Monadnock Music concerts, the Monadnock Summer Lyceum, MAXT Makerspace and Mariposa Children's Museum. Peterborough's First Saturday contradances are a place for singles and dance enthusiasts to enjoy live music in the spacious Peterborough Town Hall. Peterborough's solar energy facility is the largest in New Hampshire. The town of Peterborough is a leader in sustainability: It has been cited by the US Environmental Protection Agency for its Green Purchasing Practices; since 2014, the town achieved 100% reliance on sustainable energy. Its model for funding the largest solar facility in New Hampshire has drawn national and international attention, including climate scientists from around the world in the US Department of State's International Visitor Leadership Program. The solar array was built atop a wastewater treatment plant. The parade of giant creatures is a highlight of Peterborough's annual Children in the Arts festival. Many artists' introduction to the town comes as fellows to the MacDowell Colony, a wooded creative retreat that provides grants to over 250 artists per year. "While working at MacDowell, Leonard Bernstein composed his Mass; Aaron Copland composed Billy the Kid; Thornton Wilder wrote Our Town and The Bridge of San Luis Rey; James Baldwin wrote Giovanni’s Room; Willa Cather wrote Death Comes for the Archbishop; DuBose and Dorothy Heyward wrote Porgy and Bess; and Virgil Thomson composed Mother of Us All. Alice Walker worked on her first novel and Meridian at MacDowell. Michael Chabon wrote The Amazing Adventures of Kavalier & Clay; Alice Sebold wrote The Lovely Bones, and Jonathan Franzen completed The Corrections." The town celebrates First Friday monthly with presentations by MacDowell Colony artists, along with gallery openings, special shopping opportunities, and events in the downtown area. Favorite hang-outs include Harlow's Pub with its live music, Cooper Hill Public House and the Riverside Water House. Once a year, the Colony opens up its grounds to the public when it presents one person with the MacDowell Medal. The town has approximately one restaurant for every 200 residents. Restaurants line Route 202, from family-style Brady's American Grill north of town to The Pearl and the Parker House Coffee Roaster on south 202. The Peterborough Diner, a classic Worcester railway lunch car in the center of the village square, attracts many presidential hopefuls every four years. Peterborough hosts many events. The Snow Ball in January, Children and the Arts Day in May, Thing in the Spring music festival in June and Greenerborough, a summer festival promoting the town's leading position in sustainability, are just a few of the music, arts, farm, energy and nature celebrations held annually. New Hampshire's oldest continuously active state militia unit, the Lafayette Artillery Company, was founded in Peterborough in 1804. It is now based in nearby Lyndeborough. However, since the early 20th century, Peterborough has been home to the Amoskeag Veterans, founded in Manchester in the mid-19th century. The town was a model for the play Our Town, written by Thornton Wilder while in residence at the MacDowell Colony. His fictional town of Grovers Corners appears to have been named for Peterborough's Grove Street. At the corner of Grove and Main streets, a cell-phone Quick Response Code near the horse-head fountain starts a QR-code tour of Peterborough. The Mariposa Museum is dedicated to celebrating different cultures while offering visual and audio aids to further teach the importance of diversity. In addition to providing a multitude of different cultural perspectives, the Mariposa Museum also houses a massive collection of marionettes and puppets, which visitors can experience on the main floor of the museum. Conservationists watch for raptors in Peterborough. ^ a b "Geographic Identifiers: 2010 Demographic Profile Data (G001): Peterborough town, Hillsborough County, New Hampshire". U.S. Census Bureau, American Factfinder. Retrieved November 6, 2015. ^ "Geographic Identifiers: 2010 Demographic Profile Data (G001): Peterborough CDP, New Hampshire". U.S. Census Bureau, American Factfinder. Retrieved November 6, 2015. ^ a b Coolidge, Austin J.; John B. Mansfield (1859). A History and Description of New England. Boston, Massachusetts: A.J. Coolidge. pp. 613–615. ISBN 1-4369-8768-7. ^ "Abiel Abbot". Explore Our Town. Monadnock Center for History and Culture. Retrieved December 14, 2015. ^ "History". Monadnock Summer Lyceum. Retrieved December 14, 2015. ^ "History". Peterborough Town Library. Retrieved December 14, 2015. ^ Mansfield, Howard. 2004. Bones of the Earth, Shoemaker & Hoard, Washington, DC, p. 148. ^ Lauren Bergeron (February 23, 2010). "The Folkway: It was 'a community'. Former Peterborough venue remembered". The Keene Sentinel. Retrieved December 14, 2015. ^ "ACC Earth Day Organizer's Guide". ACC CES/ESC. 1996. Archived from the original on December 22, 2015. Retrieved December 14, 2015. ^ "The Peterborough Town Library: The Oldest Free Public Library in the World Supported by Taxation". libraryhistorybuff.org. Retrieved November 17, 2016. ^ "HISTORY: Peterborough Town Library". Peterborough Town Library. Retrieved November 17, 2016. ^ a b c "Profile of General Population and Housing Characteristics: 2010 Census Summary File 1 (DP-1): Peterborough town, Hillsborough County, New Hampshire". U.S. Census Bureau, American Factfinder. Retrieved November 6, 2015. ^ "Selected Economic Characteristics: 2009-2013 American Community Survey 5-Year Estimates (DP03): Peterborough town, Hillsborough County, New Hampshire". U.S. Census Bureau, American Factfinder. Retrieved November 6, 2015. ^ "About ConVal High School". ConVal School District. Archived from the original on January 10, 2008. Retrieved November 4, 2007. ^ "South Meadow School Handbook". ConVal School District. Archived from the original on September 8, 2007. Retrieved November 4, 2007. ^ "History of The Well School". The Well School. Archived from the original on October 16, 2008. Retrieved November 4, 2007. ^ "Peterborough, New Hampshire". Peterborough Economic Development Authority. Retrieved December 14, 2015. ^ Jocelyn Mackie (April 15, 2015). "Top Three Industries in New Hampshire". Newsmax. Retrieved December 14, 2015. ^ "Raptor Observatories". NH Audubon. Retrieved December 14, 2015. ^ "Green Power Leadership Awards: 2014 Award Winners". US Environmental Protection Agency. Retrieved December 14, 2015. ^ Benji Rosen (June 17, 2015). "Climate scientists visit town: International energy experts hope to learn from solar project". Monadnock Ledger-Transcript. Retrieved December 14, 2015. ^ David Brooks (November 6, 2015). "Peterborough to turn on state's largest solar-power facility". Concord Monitor. Retrieved December 14, 2015. ^ "FAQs". MacDowell Colony. Archived from the original on December 9, 2015. Retrieved December 14, 2015. ^ "Home". peterboroughdiner.com. Retrieved April 3, 2018. ^ Greenerborough. "Greenerborough Sustainability Fair". Greenerborough Fair. ^ "Our Town". Thornton Wilder Society. Retrieved December 14, 2015. ^ "Home". Mariposa Museum. Retrieved December 4, 2018. ^ Walcott, Shelley (April 22, 2016). "Local artist who collaborated with Prince reflects on icon's death". wmur.com. Retrieved April 3, 2018. ^ "Professor Elting E. Morison dies at 85". mit.edu. Retrieved April 3, 2018. ^ Goodwin, Tim (February 18, 2019). "'Clue House' in Peterborough inspired Parker Brothers". Monadnock Ledger–Transcript. Retrieved February 28, 2019. Wikivoyage has a travel guide for Peterborough (New Hampshire).